You are currently on: How can we best use the earth’s geothermal energy sustainably for all of our futures? 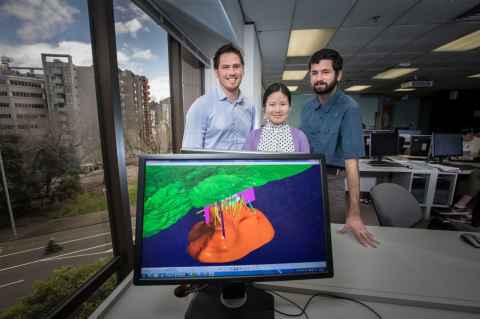 Dr John O’Sullivan, Lecturer, with Samantha Huang, Group Services Administrator, and Jeremy Riffault, Doctoral Candidate, Geothermal Institute and Engineering Science, Faculty of Engineering. Geothermal energy can provide a clean, cheap and reliable power supply in many different countries around the world. In countries like Indonesia and Kenya it has the potential to replace biomass and fossil fuel sources reducing deforestation and mitigating climate change. In other countries electricity generated using geothermal energy can be used to support intermittent renewable energy sources such as wind and solar. The nature of geothermal energy means that it cannot be transported so it creates jobs and infrastructure locally as well as opportunities for a cascade of different industries around the resource. New Zealand is a world leader in geothermal energy technology and our team at the Geothermal Institute are proud to be teaching the next generation of geothermal energy experts. Through knowledge transfer and innovative research we can use geothermal energy to help achieve sustainable development for everyone.